San Diego Renegades 2022 – Haessly ~ Josh Haessly has been part of our organization since 2012 and was previously part of the 18u Gold – Stern coaching staff having brought the Class of 2017 players up through the Renegades ranks and then merging with the 18u GOLD team as they transitioned from their travel ball careers to play softball at colleges throughout the country representing every level of collegiate play including DI, DII, DIII, NAIA & NJCAA. 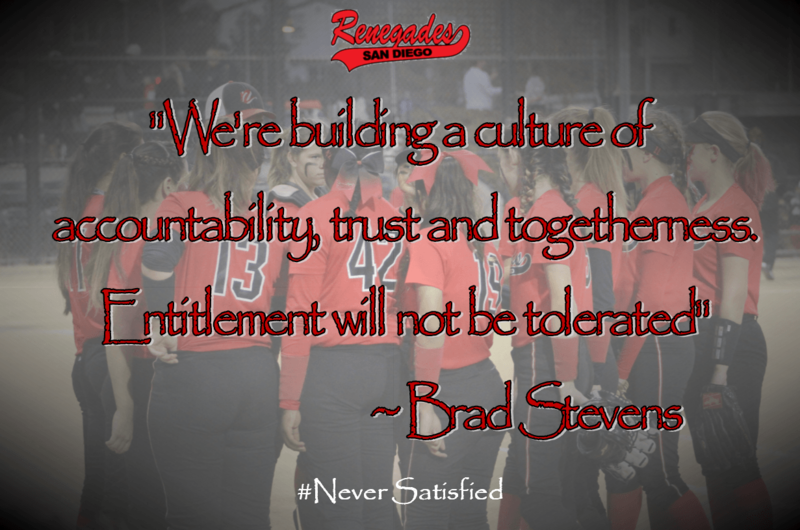 In 2016 the San Diego Renegades celebrated our 20th Anniversary and over that time we’ve helped more than 200 young ladies achieve their dream of playing softball at the collegiate level. That’s the equivalent of sending an entire team to the collegiate level EVERY YEAR! Our team is based out of Grossmont High School and is made up of girls from throughout San Diego County. We’re committed to teaching our student athletes the skills & fundamentals of the game with a tradition of helping our players get recruited and play at the collegiate level while pursuing their college degree. We believe the life skills learned while playing competitive team sports will help our players be more successful at every phase of their life. We understand that at some point their time playing this game will come to an end but things like confidence, courage, commitment & resiliency along with understanding the true meaning of being a teammate will live with them forever.